PRESS RELEASE: NCW Returns to Riverside for on March Madness 3/22! 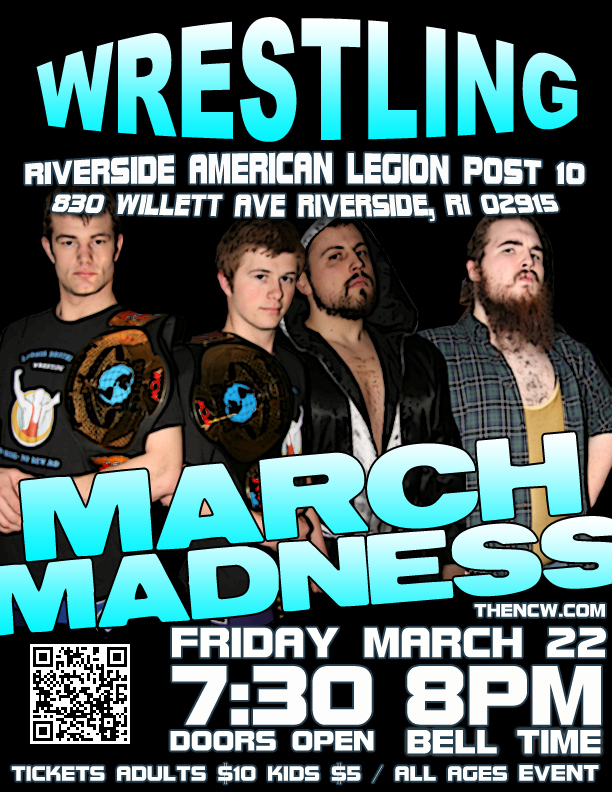 RIVERSIDE- On Friday March 22nd Northeast Championship Wrestling’s 2013 wrestling season continues when we return to the American Legion Post #10 [830 Willett Avenue] in Riverside, RI for NCW’s March Madness! Competing in a seasonal format from February through November, for sixteen years NCW has presented a unique night of entertainment for fans bringing forth our larger than life characters, dynamic storylines, and incredible athleticism all while providing a unique experience for fans of all ages. In our featured match of the evening the returning Steve “The Turtle” Weiner will make his first appearance this Season when he goes up against his former tag team partner and friend “Dynamite” Doug Summers, after Summers shockingly turned on Weiner last November. After laying low at the beginning of 2013, NCW Commissioner Dean “The Beast” Livsley has convinced Weiner to return to the ring in Riverside to finally exact revenge on “Dynamite” Doug. When NCW comes to Riverside the two time Heavyweight Champion “The Juice” JT Dunn will defend his Heavyweight Championship when he takes on the four time former NCW Champion Triplelicious. A part of NCW since 1997, Trip looks to reclaim his place as the very best wrestler in Northeast Championship Wrestling when he locks horns with “The Juice”. PLUS the 2012 Rookie of the Year Anthony Greene, the Lumberjake, NCW Tag Team Champions the Loomis Brothers, “RIOT” Kellan Thomas, “The Original Showoff” Mike Paiva, Pacifico, & many more! The American Legion Post #10 is located at 830 Willett Avenue in Riverside, RI. Doors open at 7:30pm with an 8pm start time for the wrestling action to begin. Tickets are only $10 at the door for adults and only $5 for all kids twelve and under. For up to date information on Northeast Championship Wrestling be sure to visit us online at http://thencw.com and like us on Facebook at http://www.facebook.com/NCWwrestling.